YellowAirplane.com: Air and Space Museums in Connecticut. Connecticut Air and Space Museums. from the YellowAirplane Resource Center. F-18 Hornet Museum Quality Model Airplane Kits. A List of Air & Space Museums in Connecticut. Aircraft museums in Connecticut are few but still there. Connecticut is one of the most historic states in the Americas. For a small state, it is sure full of military bases and naval bases. Connecticut is nicknamed the constitution state. Connecticut has a land area of 4,845 square miles and is number 48 in size of the 50 states. Connecticut's population is 3,295,700 and is number 27 in population of the 50 states. Its largest city is Bridgeport and its capitol is Hartford. Connecticut's highest point is Mount Frissel which is 2,380 feet. Please note the background on this page! It is a photo of the actual paper from the 34th Fighter Squadron yearbook from World War 2. Click here to see the 34th Fighter Squadron Exhibit. Due to legal changes in Illinois, I will not be updating this list until further notice. These museums change their information and locations very often. Please try to contact the museum before you try to visit it, it may not be there anymore. Glad to see you have compiled such a complete list of aviation museums. I'm using it in my quest to see all the surviving P-38s. Just a note to tell you that the New England Air Museum in Windsor Locks has about 75 aircraft, not about 49 as you site states (see www.NEAM.org). There is also a group working on getting an aviation museum in the former Vought-Sikorsky aircraft plant in Stratford, CT. I also wanted to show you where I went yesterday now that you've got me back on my airplane kick. It's a museum I'd never been to before, and I assumed it was just a little one with a few old airplanes sitting around sinking into the floor in some old unused falling-apart hangar. Boy, was I wrong! They have quite an extensive collection of planes, many of them from WWI and WWII, some being restored, others already completed. Mighty impressive. I didn't have enough time to see everything, of course, which means that I'll need to go back. Again and again an again. According to their brochure, they have a large collection of archived material, too, not that I know what it contains. NASA EM-31 Ice Thickness Project. 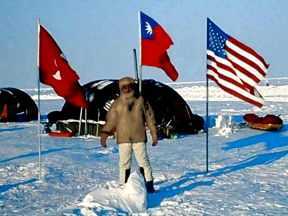 South Pole Adventure A tremendous story about one of the Worlds Greatest (unknown) Explorers, Curtis Lieber. Who has gone to the North Pole. A summary of early North Pole Expeditions. Real Mustang Sports Cars for Sale..
Christopher Pala's North Pole Expedition 2000.